I adopted my very first greyhound more than 9 years ago, and from the first day he seemed to be very confident and quite comfortable in his new home. I was the one who was a little nervous. I wasn’t at all sure that I was properly prepared to meet the needs of this nearly 5 year old ex-racer. I’d never before brought an adult dog into my home and I wasn’t sure that I knew how to proceed. But Niles immediately climbed onto the big stuffed bed I’d hurriedly purchased for him and was soon napping contentedly. I snapped a few pictures and then settled in to watch his chest rise and fall as he slept and to contemplate what our lives would be like now that I’d committed to caring for this big dog for the rest of his life. That was in 1994 and digital cameras were not something I’d even heard about, so several weeks had passed before I finished that roll of film and dropped it off for processing. As I shuffled through the prints I found myself looking more closely at the dog in the photos and the one who now lay sprawled in the shade of a tree in our backyard. There was something very different about the dog who cheerfully woke me every morning at 5:30 AM for our walk and the one in those pictures. It took a little time to discern the almost imperceptible changes that had taken place in the weeks since Niles had arrived, but I finally realized that the little wrinkles on his forehead were gone. And his eyes, which in the pictures were just the normal sized eyes one would expect in most dogs, now appeared much larger. How could that be? Eyes don’t grow, do they? The pictures showed a creature who was stressed and uncertain, the dog who now lived dog who now lived in my home bore little resemblance to those images. His forehead was smooth and those big dark eyes held immense intelligence and such love that they put a lump in my throat. 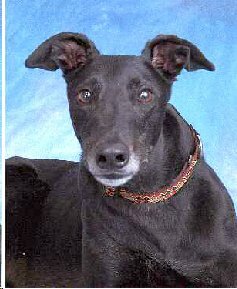 When the second greyhound moved into my home and my heart, in that order, I was more prepared for the changes that were to come. But once again, I found my heart lurching when I picked up a batch of snapshots taken of her shortly after her arrival. One of them was to become my favorite of this new girl, Raisa, who through no fault of her own, was given up by the only owner she’d ever known. I’d purchased a big comfie bed for Niles and although he was not unkind about sharing, Raisa always deferred to him when he wandered into our bedroom and gave her the “Look”. I quickly ordered Raisa her very own Snuggum and the day it arrived I snapped a picture of her looking very regal (or so I thought) on her new bed. The actual photo shows a very worried looking Raisa. I’m sure she thought that any minute she was going to have to give up that wonderful new bed. Once again, the changes that had occurred in her appearance in the weeks since her arrival were subtle, but they were there. Shortly after Raisa settled in I agreed to take a 14 month old Italian greyhound from a Puppy Mill that was being closed down in Georgia. Keegan was certainly the most frightened and distressed of all of the dogs I’ve ever encountered. The worry wrinkles on his forehead made me wonder if he might have a little sharpei mixed in with the IG that he was supposed to be. It’s taken many years of patience and understanding, but he’s slowly come to trust me and I rarely see those lines of stress these days and his eyes seem to have “grown” just as Niles’ did. 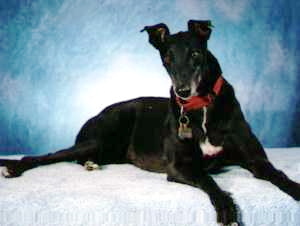 A few months after losing Raisa to kidney disease I adopted Blue Skye, one of the homeliest greyhounds ever. Now wait! Don’t light up those torches to burn me at the stake just yet. Once we got through the first few months I learned that she was a very sweet and loving girl, just not terribly attractive. For one thing she’s very tall and very narrow, which gave her a gangly look and she’s got light colored eyes, as is often the case in the Blue dogs and she sometimes looks a little demented because of them. I should have known that it would only be a matter of time before she relaxed and that worried and pinched look would subside and she’d be as lovely as all the other greyhounds I know. But, silly me, I persisted in making jokes about my ugly duckling. We have an amazing Pet Photographer at the Great Lakes Greyhound Gathering each year but as one of only four volunteers I’m usually too busy to have my dogs attend. I did get Skye into Woof Studio’s mobile studio for a quick portrait last year and although I didn’t expect too much, I was eager to see what they’d done with my homely girl. They’d dropped her portrait off at the local Pet Supplies Plus because it was too big to be easily and safely mailed. I’d have saved myself some embarrassment if I’d just kept my big mouth shut when I stopped in to pick it up. The employees all gathered to see what was in that big envelope and I felt the need to warn them to be prepared — this was not going to be a great picture because the subject was not exactly a beauty. I couldn’t have been more wrong!!! It was stunning! Just about as gorgeous as any dog portrait I’ve ever seen. When the gasps of surprise and awe subsided, I stammered that I’d been joking about her and made my escape. But I saw the looks that passed between the employees, they were thinking that I didn’t deserve such a beautiful dog. I felt so foolish and so guilty that I agreed with them.